The FlowerHouse Harvest House X-Up Plus is designed for quick and easy set up. Its size is ideal for smaller areas. The Harvest House Plus measures 6.5 ft. high by 4.5 ft. wide by 2.5 ft. deep. 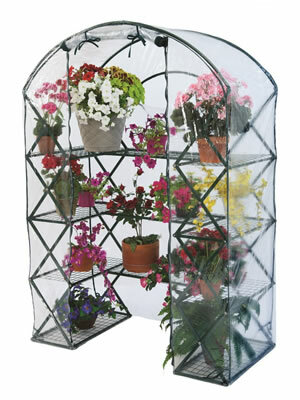 This greenhouse features lift and lock X-Up shelves already in place and an easy to slip on clear cover. The frame pieces are easy to connect and can be set up on soil or hard surfaces. When it's time to put your Harvest House Plus away, it simply folds down for compact storage. Stakes and high wind tie downs are included. The unique X-Up technology provides an extraordinarily easy set-up and take-down of the FlowerHouse shelving while providing the support and maximum light and heat transmission of the clear PVC cover (included). 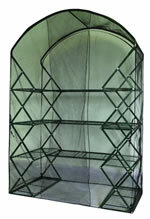 The Bug Netting cover is designed to provide netting that keeps bugs, birds and other pests out of your greenhouse. This cover reduces very little light so plant growth won't be affected. The Blackout cover is a convenient storage cover that can double as a flower forcing cover. When it's time to put away the HarvestHouse for the season, this cover will keep dust, dirt and insects from damaging the greenhouse. As a flower forcer, it helps reduce the amount of sunlight reaching mature, flowering plants to promote big, beautiful blooms. The Gro-Tec cover is a made of reinforced woven polyethylene which is UV protected and has 80% light transmission. It is also opaque which is more beneficial for plant growth than clear glass or plastic because it diffuses or scatters light.